Photo Courtesy of the Professional Fire Fighters of Mass. 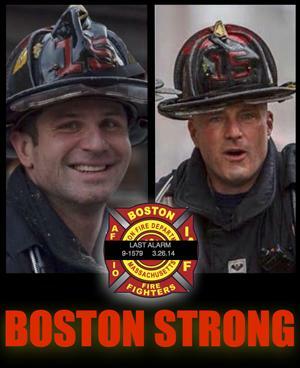 As members of the Back Bay’s Ladder 15, Walsh and Kennedy were among the first to enter the dwelling. Driven by high winds the fire unexpectedly spread, trapping the firefighters in the building’s basement. However, firefighters were able to safely evacuate all of the buildings residents. The family of Lt. Walsh has long been active members of our Association. Both Eddie’s father and uncle are retired Watertown Firefighters, as is his cousin Tom Walsh. Our thoughts and prayers are with the families of these two brave men, as well as the 13 firefighters and five police officers who were injured fighting the severe blaze and rescuing building residents. A fund to benefit the families of Lt. Walsh and Firefighter Kennedy has been established by the Boston Firefighters Credit Union.